As Republicans rush to repeal the law, even conservatives are starting to worry about what will happen next. Since June 2009—before the Affordable Care Act even became law—congressional Republicans have promised to be weeks away from proposing their own blueprint for health-care reform. More than seven years later, House Speaker Paul Ryan still seems confused about whether his party does or does not have a plan ready to replace the ACA. “We already know what we’re replacing with. We’ve been extremely clear with what replace looks like,” Ryan insisted in an interview on Wednesday. The following day found him pleading with a reporter for more time. “We’re just beginning to put this together,” Ryan admitted. Regardless, Republicans are moving quickly to gut the ACA. Repeal will be the “first order of business” for the new administration, vice president–elect Mike Pence said on Wednesday after speaking to GOP lawmakers on the hill. That same day Senate Republicans began laying the groundwork for a budget maneuver that would allow them to roll back parts of the law with a simple 51-vote majority, thus skirting a Democratic filibuster. Despite the fast pace, the plan is remarkably shaky—not just in detail but also for the lack of political support behind it. Almost no one outside Congress thinks the GOP’s current strategy is a good idea, and even a few Republican lawmakers are getting skittish. The strategy has been dubbed “repeal and delay.” Republicans could eliminate major pieces of the law within a matter of weeks. But party leaders want to postpone the date the rollback goes into effect, by a couple of years, to prevent disruption in people’s insurance coverage (read, to protect themselves from blowback in the 2018 elections). In the meantime, Republicans promise, they’ll pass a replacement—“something terrific,” to quote Donald Trump. At risk is federal funding for the Medicaid expansion, which covers people just over the poverty line, as well as the subsidies for insurance purchased in the government-run marketplace. Taxes that pay for expanded coverage would also be eliminated. 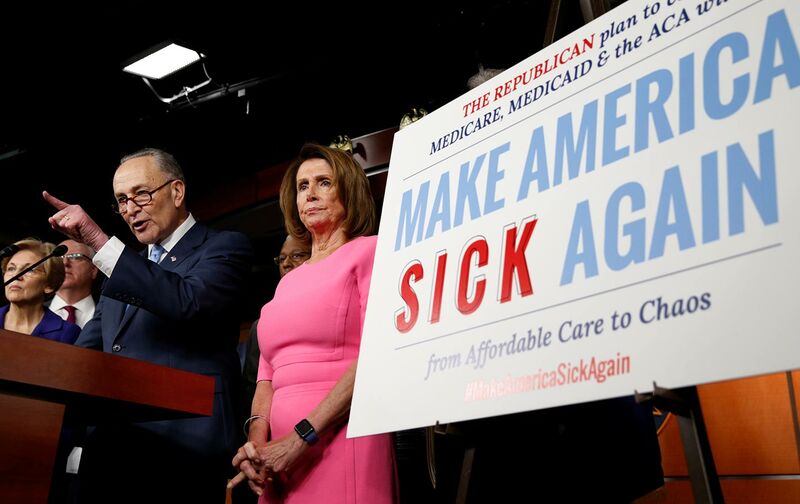 Ultimately, 22 million Americans could lose their health insurance, according to an analysis by the nonpartisan Congressional Budget Office of a similar repeal effort congressional Republicans passed in 2015. Even if the repeal rolls out on a delayed schedule, uncertainty may provoke insurers to pull out of the marketplaces. Hospitals could bear a staggering financial burden from uninsured patients, leading to “an unprecedented public health crisis,” they warned last month. Only one in five Americans supports the GOP's "repeal and delay" strategy. Objections to a quick repeal are also coming from Republican leaders in states with a lot to lose if federal dollars for the Medicaid expansion are yanked back. Ohio Governor John Kasich said Thursday that he wants “to know what’s going to happen to all those people who find themselves left out in the cold.” In Michigan, where more than 642,300 people have signed up for the state’s version of the Medicaid expansion since 2014, Republican Governor Rick Snyder defended the program in a recent interview, calling it a “successful” model. Arizona Governor Doug Doucey has also urged against repealing the law before a viable replacement is in place; about 400,000 of his constituents could lose coverage if federal funds for the Medicaid expansion disappear. Montana House speaker Austin Knudsen voiced similar concerns last month. Conservative health-care experts at the free-market think-tank American Enterprise Institute also came out against the strategy. “The most likely end result of ‘repeal and delay’ would be less secure insurance for many Americans, procrastination by political leaders who will delay taking any proactive steps as long as possible, and ultimately no discernible movement toward a real marketplace for either insurance or medical services,” AEI’s Joseph Antos and James Capretta wrote Monday. And on Monday, the American Medical Association—the country’s largest physicians’ lobby group—joined a variety of other physician and patient groups in opposition. The AMA is not a liberal group: It endorsed Trump’s conservative, anti-Obamacare nominee to head the Department of Human of Health and Human Services, and though the organization supported the Affordable Care Act, it has historically opposed expansions of health insurance coverage. In its letter, the AMA urged Republicans to ensure “that gains in the number of Americans with health insurance coverage be maintained,” and to lay out plans for a replacement policy before repealing current law. “Patients and other stakeholders should be able to clearly compare current policy to new proposals so they can make informed decisions about whether it represents a step forward in the ongoing process of health reform,” the group’s chief executive wrote. There’s the rub: If Republicans are forced to lay out a detailed replacement policy, it will likely include plans with higher deductibles and fewer benefits—which is exactly what Republican voters currently covered by the ACA say they don’t want. In focus groups convened recently by the Kaiser Family Foundation, Trump voters living in the Rust Belt described their ideal health plan as one that would “keep out-of-pocket costs low, control drug prices and improve access to cheaper drugs.” No one wants to lose their insurance, even if they’d like it to cost less or be less complicated. But preserving coverage for the people who’ve gained it since the ACA passed, along with popular parts of the law like the ban on exclusions for people with preexisting conditions, is hard (if not impossible) to do without also keeping the parts of Obamacare that people hate, like the individual mandate. Republicans have been able to dance around these contradictions for several years, but they’re looking more and more clumsy.